Would you like a screensaver to download high-quality desktop wallpapers automatically and display them in a beautiful slideshow? Endless Slideshow Screensaver can do that and it's absolutely free! Just choose wallpaper categories that you like from the list of more than 20, including Nature, Girls, Men, Anime, Games, Cars and others and let the screensaver do the rest while you enjoy the slideshow. And it's so easy to set up this wallpapers screensaver - you'll be up and running in just a few minutes! Here is a quick step-by-step tutorial. First of all - use the button below to download and install the most recent version of the screensaver. It downloads and installs in seconds with just a few mouse clicks. Once the screensaver is installed you will see standard Windows Screen Saver Settings with Endless Slideshow Screensaver preselected. Click [ Settings... ] button to open the screensaver settings window. 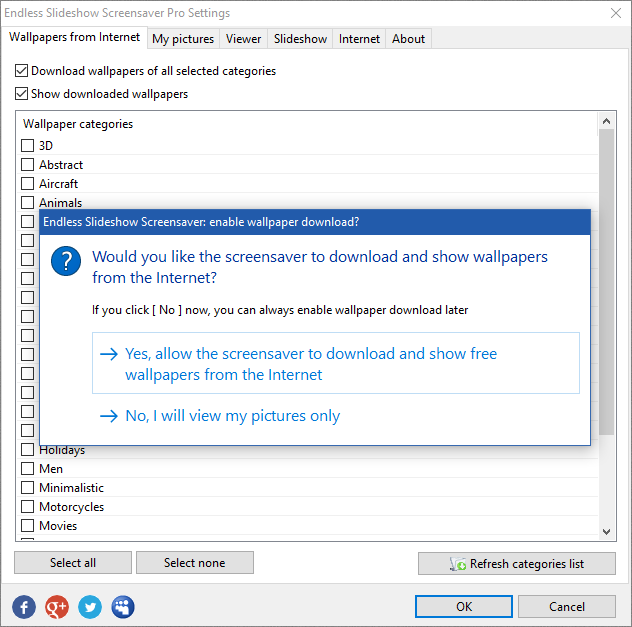 When you open screensaver settings for the first time you will be asked if you want to allow the screensaver to download and show free desktop wallpapers. Click [ Yes ] button and the list of available wallpaper categories will be shown immediately. Now you can select your favorite wallpaper categories here. Simply check boxes next to the category names you like. Every time the screensaver starts, it chooses a random category among selected and downloads free wallpapers to your PC. And then uses all downloaded wallpapers from all selected categories to create beautiful slideshow with wide variety of transition effects. You can configure Windows to start the screensaver after a certain period of inactivity using the Wait field in the Screen Saver Settings window shown above. But you can also start it manually, just like any other Windows application, using shortcuts created on your desktop and in Endless Slideshow Screensaver folder of Windows Start menu. Just click Start Endless Slideshow Screensaver and enjoy the slideshow! You can easily mix photos from your PC and local network folders with downloaded wallpapers in the slideshow. You just have to add those folders with your photos on the My pictures tab using [ Add folder ] button. 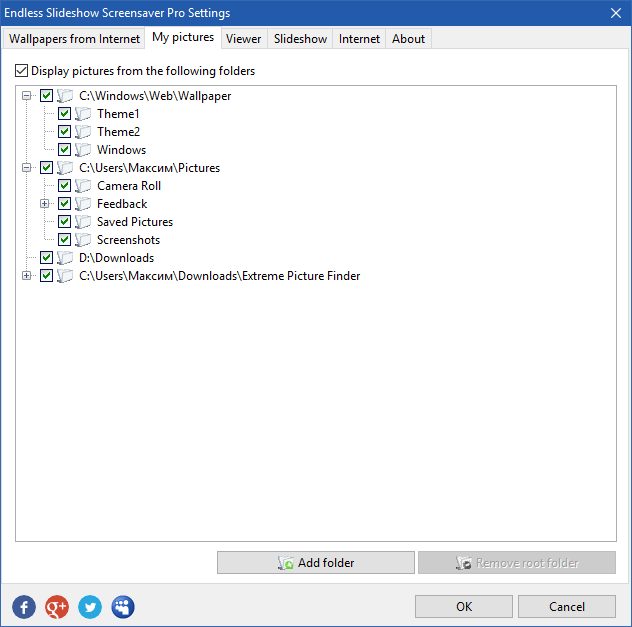 By default all downloaded wallpapers are saved into a sub-folder inside the Downloads folder called Endless Slideshow Screensaver. 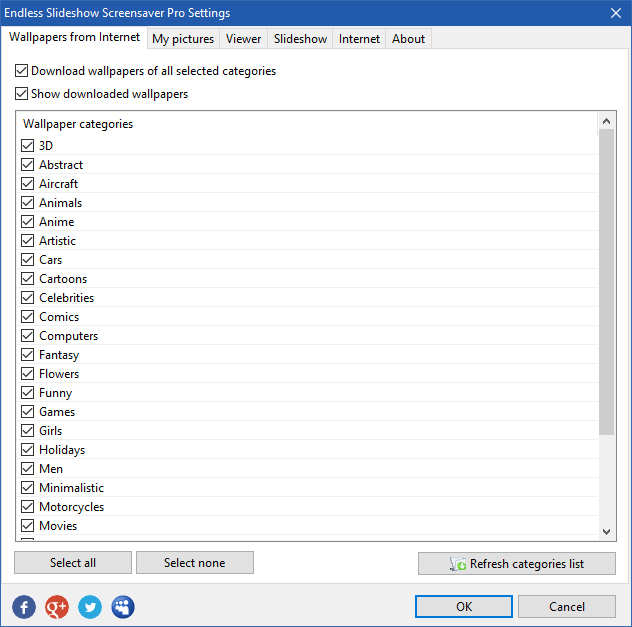 But you can easily choose another folder on the Internet tab of the screensaver settings. 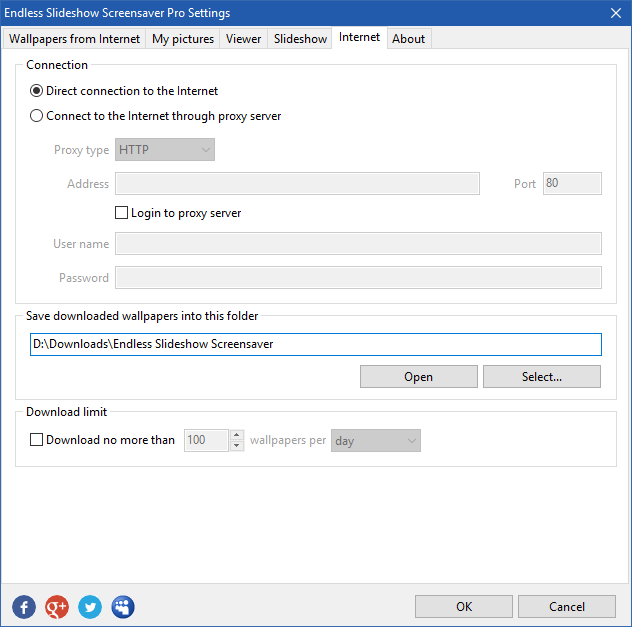 You can also set download limits here. Whenever you see a beautiful image in the slideshow - you can set it as your desktop background with a single key press! Just hit [ Enter ] key to make currently shown image your new desktop background. It won't interrupt the slideshow and you'll continue enjoying it!